Gum disease is a problem where many people simply are not aware that it is present. That is why it is frequently described as a "sneaky" disease. While we can explain some of the signs which tell you if you have gum disease, you can still have gum disease even if you aren't aware of any of its signs. If your gums are bleeding when you brush them, you definitely have gum disease. However, since many poeple do not brush where the gums meet the teeth (where you should have the brush in contact with the gums), they may not have any evidence of bleeding, even though gum disease is present. This is why the absence of bleeding gums does not mean there is no gum disease. 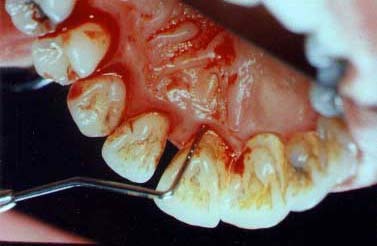 This shows a patient who has gums that bleed readily. Here a periodontal diagnostic probe is shown evaluating the gums. Notice the space between the two teeth. This space wasn't there all of her life -- see the following description of how "new" spaces are a sign of gum disease. Bad breath can be a sign of gum disease or it can be present if there is no gum disease. Bad breath can be caused by certain foods, the lack of proper cleaning of the teeth even with no gum disease, the build-up of bacteria on the tongue or even from stomach problems. However, if bad breath does not go away after brushing and flossing properly, including brushing the tongue, you must consider that there may be serious gum disease where the pus and bleeding from the disease are contributing to the bad breath (oral malodor). The normal gum color is usually described as "coral pink". If you see that your gums are red in color you should be suspicious that gum disease is present. Reddened gums may not always bleed. However, if you have red gums, especiall shiny red gums, and even if they don't bleed upon brushing them, you should see a periodontist. If you are a "mouthbreather" this can contribute to the appearance of red gums and their gum infection. If you notice that you now have a space between two teeth that was not there before, that is usually a sign that gum disease is advanced and has weakened the teeth. A gum disease aggressiveness screening with a periodontist is important to schedule. If you notice a change in the gum level, and your gums are receding, this can be a sign of gum disease. This gum recession can occur between the teeth or on the front (root surface) of one or more teeth.